Reinforcing your JK Inner C’s for offroad use! If you plan on doing any serious offloading, the Rubicon Dana 44 front axle will hold up to 37″ tires just fine, but it certainly can use a little beefing up in a few key areas – such as trusses, c braces, and tube sleeves. When welding braces like the ones from Artec onto cast steel, there are a few minor procedures to follow. Forged steel is much less forgiving than cast iron, but you still should pre-heat it a bit and plan on replacing your ball joints at the end. Some folks try and save them, but I find it to be far too much trouble and its a great excuse to upgrade to something serviceable. This is a difficult job and can be done by a shade tree mechanic, but is best left to professional welders. Contact Us if you would like to schedule an appointment and please feel free to post any questions below! Step 1. Remove the brakes, rotors and axle shafts. Step 2. Raise the Jeep at the frame allowing the axle to fully droop and disconnect the sway bar & remove the coil springs & shocks. Step 3. Test fit the Weld On Jeep JK Inner C Braces and trim as necessary until they fit clean. Step 4. Place a wet paper tower inside each inner seal, and towards the end of each axle tube to keep things cool and weld slag out. Step 5. Wrap all remaining components in a suitable welding blanket to protect them. Step 7. Tack weld the inner c’s at all the areas you plan on running a bead. Step 8. 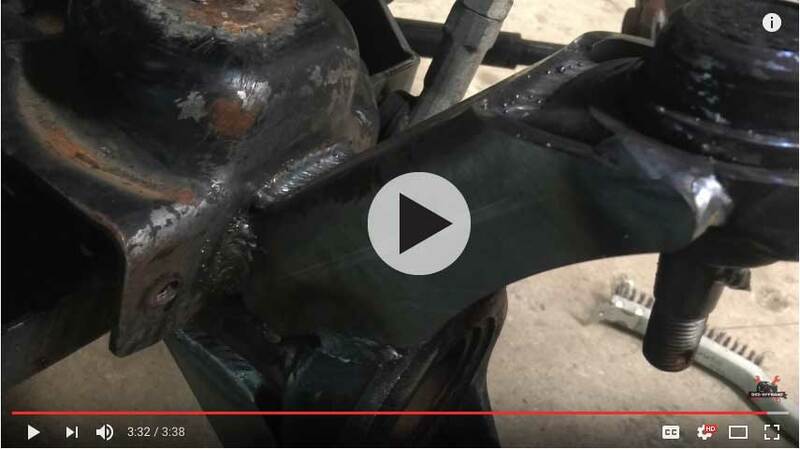 Fully Weld On Jeep JK Inner C Braces working in 2″ sections on opposite sides and allowing 30 seconds between beads to keep the inner c from becoming too hot. Step 9. Paint & reassemble! Watch the how to video below!